Remember that Futurama episode where we first see the Professor's Smell-o-scope? FRY: This is a great, as long as you don't make me smell Uranus. Heh heh. LEELA: I don't get it. 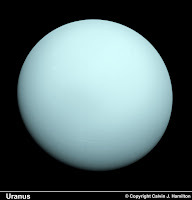 PROFESSOR FARNSWORTH: I'm sorry, Fry, but astronomers renamed Uranus in 2620 to end that stupid joke once and for all. FRY: Oh. What's it called now? Little Boy: Do have a book called Exploring Uranus? Me: Did your older brother put you up to this?! Turns out, he had just read Exploring Jupiter and wanted the next book. ANYWAY! Today, we got a book in called A Look at Uranus. I keep giggling to myself. tee hee hee! Yes, I am 10. Shut up. You are such a sillyhead!